I have been litter-picking with a group of Dot Dot Dot guardians in Stepney for a number of months now and it has been great to see the group develop. When we first started (back when it was still sunny in the evening!) there were just a few of us who would go out every week and go around the local area where we live. This small group soon expanded, and not just with more guardians but also with people from the local community joining in too. We have people joining in for various reasons for example as part of their Duke of Edinburgh award, and simply just to get involved in some local volunteering. We also had local girl Lorraine Chase from Emmerdale join in once too! It has been great to see that being a visible group in the local area has attracted some good attention. We often get people stopping us as to ask how they can get involved or just to say a ‘thank you’ and ‘you’re doing a good job’. I think the fact that the group is such mixture of men and women and of various different ages it makes us more approachable, and people are more likely to join in. 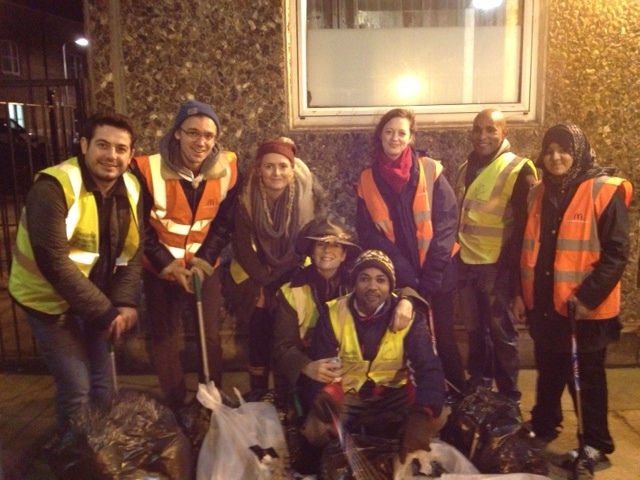 So if you see us walking around Stepney with our litter-grabbers and in our hi-vis jackets please do come and say ‘hey’. We often carry around spare bags and jackets so you too can get involved!